Us tech folk over at Key Code Media got a shiny new Mac Pro. 12 core, 32GB RAM, dual D700s with a a 512 stick of flash memory. My first 2 cars combined cost less than this beast. Check and/or replace cables. Try different Thunderbolt and USB ports. Remove all peripherals, except keyboard and mouse. Swap out monitors and Thunderbolt to DVI adapters. Verify all apps installed are Mavericks compliant. Repair permissions and examine hardware via Disk Utility. No dice. Mac Pro still locked up within 10 seconds of boot. Many times, I had to do a forceful cold boot: Power down while the CPU is running (but frozen), via the physical power button. Unplug the CPU, and again press the power button to drain the trickle charge of the unit. Why? Often, a force shutdown via the power button would bring up an error on reboot telling me that the machine had been shutdown incorrectly. I would then get a beachball, and I’d be unable to continue. Draining the trickle power seems to remedy the error message on boot. Upon viewing the system.log files, the logs revealed a few things that showed that the indexer for Spotlight may be causing issues. The log was littered with entries showing that the sandbox – mdworker was having issues accessing files. As you may know, mdworker is tied to Spotlight. Why does Spotlight seem like a possible candidate? The logs are littered with these entries and this was the last entry before some garbage at the end of the system.log. There were over 1350 entries in the last few minutes. Google shows there was at least one mention of these seemingly hanging a Mac system. plication Support/Adobe/CEPServiceManager4/extensions/Adobe Mini Bridge 3/CSXS, exiting to clean up now. I was able to postpone the inevitable lockup by immediately putting the Mac OS drive into the Privacy section of Spotlight. The lockups still happened, but it would take a few minutes of use before the freeze. I also attempted “sudo Mdutil -E” to stop Spotlight and re-index – again, this just slightly delayed the inevitable. When the lockups and unpredictability became too much for reliable work, we decided to do a clean install. This is where it got really fun. Booting from the recovery partition: Disk Utility did not see the Mac OS partition. When it occasionally did see the partition, the OS volume would appear, but not mount. When the volume did occasionally mount, and the Mavericks install process began, the Installer did not see the OS partition as being able to handle Mavericks (i.e. no option to choose the OS partition). See picture. Recovery and Internet Recovery: No OS partition can be seen to install Mavericks on. Internet Recovery : Similar issue. 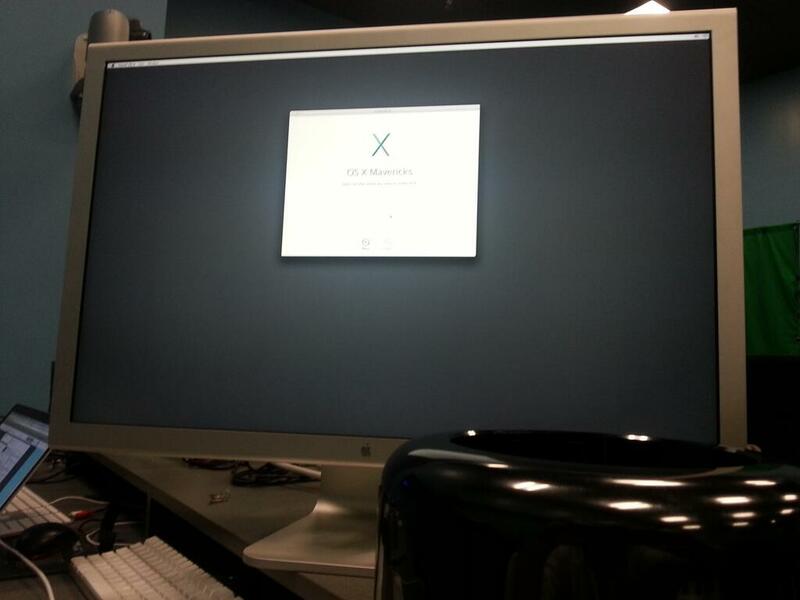 Mavericks could not be installed on the partition – the OS partition was not seen. Apple Diagnostics (formerly AHT): no problems found. AST: As we are an Apple Certified Repair Center, we have a network AST server. This found no errors. Download Mavericks on MacBook Pro, create bootable Mavericks installer USB stick: creation of USB stick is successful, but the new Mac Pro is unable to boot from the stick. Tried 2x with different stick creation methods. Target mode from a 10.8.5 MacBook Pro: Ran Diskwarrior. No “disk” problems, and only a few permissions issues on 3 files. As a safety, I quarantined those files. Lock ups still occurred. Downloaded Mavericks from the App store on the flakey MacPro. I began the installer. Error Message: Mavericks cannot be installed on this computer. See picture. 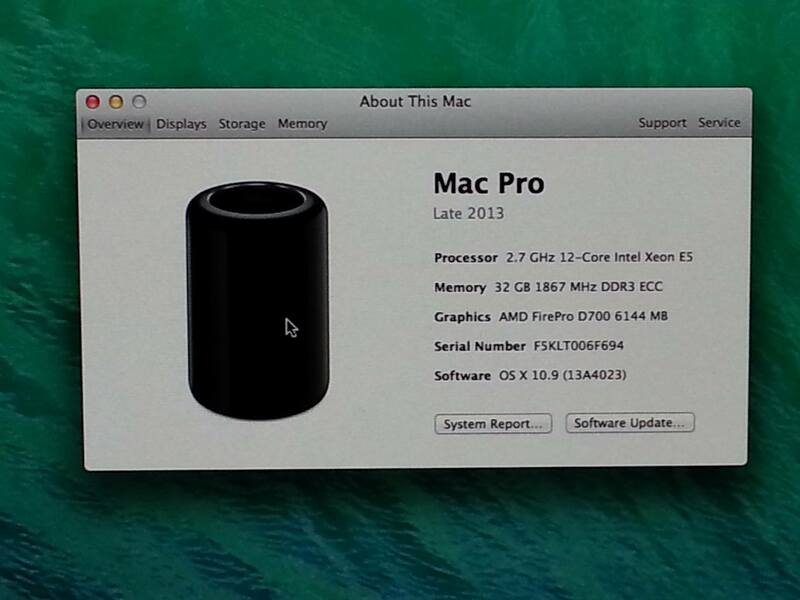 Second new Mac Pro to Target from, do diagnostics from, etc. : The additional Mac Pro cupboard was bare. I should add that at any time, I could *still* boot up normally, and use the computer for a few minutes. App store download of Mavericks can’t be installed on the Mavericks OS. Not wanting to delve more into additional Terminal work (plus, I really shouldn’t *have* to on a brand new machine), I gave in and called Apple support, and got through within 2 minutes. Extremely courteous technician. Sadly, I was told “You’re the first [new] MacPro call I’ve received!” He went on to say the machines were very stable, hence no calls, but unfortunately, I took it the other way: “…we don’t have a ton of experience with the machine.” His courteousness and willingness to help overshadowed this concern. After an hour or so of discussing, troubleshooting, and being placed on hold, I was transferred to a Senior Technician. Also, completely professional and polite. They verified that if I opened up the hood and did some minor work on the engine, I would not be breaching warranty. They had me reseat the flash memory (you need a T8 torque screwdriver, BTW). Once reseated and closed up, the machine immediately exhibited the same issues. Apple then decided they would swap the machine for a brand new one, matching the config of the initial unit. 3 days later (Sunday) I received a shipping label from Apple. I received a followup call on Tuesday (Monday was a holiday) asking if I received the label, and that as soon as the unit was scanned, they would ship out the replacement unit. I, of course, have many questions as to why none of these techniques worked; and I’m not so sure it has to do with bad flash memory. It seems, to me, that perhaps there was an oversight by Apple. Why wouldn’t the Internet Recovery recognize the new machine’s OS? Why wouldn’t the LOCAL recovery recognize the OS? Why would the version of Mavericks on the App store not be current or applicable for a new Mac Pro? Regardless, we await our new (x2) Mac Pro for more testing. *Many thanks to those thoughtful tech folk who made sure I had done everything humanly possible: @octothorpe @natums @NEO_AMiGA @DCREELS @comebackshane @dwolfmeyer @philiphodgetts and Dan Bright of StorageDNA. Edit 2/25/14 : Apple called today, 7 days after we shipped out the unit. They apologized for the delay, and told us their initial ETA for a replacement was incorrect. Since the Mac Pros are backordered until April, we are put on high priority, but this still means 2-3 weeks wait time. Oh, and it was also mentioned that there have been ~70 cases similar to mine. Edit 2/28/14 : New Machine has arrived. But…with wrong GFX cards. Contacted the tech individual who has handled this case from the beginning. Our notes were in sync, he’s not sure where the disconnect happened. I was told I’d get a call tomorrow (Saturday) with the plans for the next step. Edit 3/19/14: We shipped the MacPro back, and had arrangements made for the correct one to be shipped. We, again, were put in a queue. In the 3 weeks since the last update, we received the new unit. All appears to be working well, and Apple, as a show of good faith, offered up our choice of technology from their store. For sure one of the oddest problem I’ve seen with a mac so far. =) I love a good challenge and I’m somewhat sad that nothing you threw at it worked. Wow. What a long, frustrating journey. I’m exhausted just reading that. And hey, it’s not like you’ve been waiting for a new MacPro for for like 100 years and had a high profile wager on it or anything. Here’s hoping that your new MP is trouble free! Looking on the positive side you will sure be good at tech support should this happen to one of your customers. Sounds like a bad SSD to me. If the drive’s partition table was corrupted or intermittently inaccessible that would hamper internet recovery’s ability to find a bootable OS partition to work on. Doesn’t explain target disk mode and diskwarrior “fixing” something without error, but it does sound to me like the SSD is at fault. I’d probably have tried installing mavericks to a usb3 or thunderbolt drive and booting the machine from that (and then unmount the SSD) to see if the Mac Pro would work fine with the SSD bypassed completely. Hopefully your new Mac Pro will work well. ANY copy of Mavericks I could get would NOT work on the MacPro hardware. This includes the App store (via the MacPro or MacBookPro) or Internet Recovery or local Recovery version. This is one of the reasons why the USB stick I created with Mavericks from the MacBook Pro failed. Mavericks on mac app store as you found out, is not the same flavour as the one installed on mac pro (late 2013). No usb boot or net restore either meaning if you trash the partition or drive your’re fecked (currently). I’m amazed how fast you got a replacement, my issue was fan related and I’ve been told it’s a 2 month wait for a replacement machine. Not happy at all. I haven’t received it – yet. Today is day 3 from the shipping out of the old (new) Mac Pro. I did get a call last night (8pm PST!) checking on in things and asking if I had received it, and a number to call if it has not shown up. I guess there really is European divide on customer service for replacement MacPro (late 2013) I was told in no uncertain terms my a senior Apple member in the UK that I would not see my replacement until April. Which in effect is putting me at the back if the order queue because of them sending me a faulty machine that I had ordered on 18th December got in mid Feb and sent back a couple if days later! Why does Apple not have some spare units for replacement at hand that can be configured with ram, SSD. So disappointed by Apple. This is fascinating! I am going to follow this to the max. Should have asked them to send you another flash drive. I asked if that was an option. Because they were not 100% sure it was the flash drive, and I presume in the interests of awesome customer service, they opted to just send a new unit. P.S. I have a 12core that is one week old and it is humming right along. Good thing my Adobe Anywhere runs great on a MacBookPro! Ive installed about 10 new macpro systems for clients including tb storage and aja/bm i/o. Edit: Apple called today, 7 days after we shipped out the unit. They apologized for the delay, and told us their initial ETA for a replacement was incorrect. Since the Mac Pros are backordered until April, we are put on high priority, but this still means 2-3 weeks wait time. Oh, and it was also mentioned that there have been ~70 cases similar to mine. Edit 2/28/14 : New Machine has arrived. But…with wrong GFX cards. I hope we regular “turn it on hope it works” people have better luck. I don’t have near as much fun as you super fixers do when things don’t work. I also expect that for $4000 to $5000 this thing I’ve hidden from my wife will hum like a bumble bee, a quiet bumble bee. I guess Im in the same boat after many days with frozen issues and many hours with apple care technical support try to do repairs with final cut and other programs I decide to returned; hoping to get a new one soon. Michael, any update on your new mac? I’m seeing something similar on my one. It hangs for 5-10 seconds. I thought it might be Teamviewer, as I’m using it remotley, but I’ve installed menumeters and I can see the PROC Spikeing! We’ve had no issues with the machine thus far. OS issues, to be sure, but it’s a symptom of reckless updating and incompatibility 🙂 We now have a second identical machine – both with no hardware issues. Loved the name of your post. I too have killed my mac pro. I have only had mine a few months and it had been working fine, until it wasn’t. Just died. Would not boot at all. The light on the front panel came on for about 10 seconds when the power button was pushed. Apple sent out a tech from someplace (within a few days) that was experience with fixing their computers but never had the new mac pro before. Unfortunately after swapping out a couple of parts, it still didn’t work. So he brought it back to his office. This was a couple of days ago. This is my main work computer. Wish me luck. How did things work out? 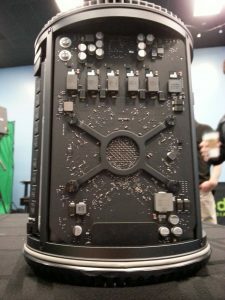 Did you ever find out the issue with the Mac Pro? I’ve got the 3.7 GHz Quad Core. 32 GB memory. Standard Card. Had it since January 2014. No issues so far. Found this article while researching online if I should use Alsoft Diskwarrior 5 on my systems SSD. From what Ive read, I should not. Just use on the external platter disks I have connected to the computer from what I’ve gathered. Since my last update to this on 3/19/14, nothing has changed. The unit has worked with absolutely no issues. Same Issue happened to me, got a new comp worked for 6 months, and that one is now back at the Apple store getting repaired and has been for over a week. Ditto here with me – Exactly the same issues – Over 4 weeks of to and fro with Senior Technicians at Apple and they still say this is not a common problem – Latest news today from the Apple Store Bench – We are still talking to Apple and our hands are tied – No offer of replacement ! Apple Care promesses to “consider the case “. No action, no answer, no respect, full arrogance, Apple 2016. I bought the Mac Pro 2013 12 cores D700 32 GB and 1TB last October 2016 since then I got issues related to lines and cuts when rendering with Davinci Resolve Studio 12.5.4 a lot of time on phone with Apple support and at last they told me to take the computer to service. Since December 31 the computer is in service, they have changed two times the video cards and the logic board once, the memory modules and the issue stills there. More than 30 days in service and now Im looking with Apple to get a new computer. Im sad because I should looked more info about the down sides of this computer before bought it. If I would it know I wouldn’t bought it and save money. Finally, unit replacement with Apple Care warranty three weeks ago. I had issues also with Da Vinci 12.5, both on the mac Pro and my MBP 15″ Retina 12/2014. I really think now that these machines are not made for professional usage anymore, means with intense activity (I produce hyper lapse with photo TIFF files) even if it is not during a long time. Apple used to make Range Rover, they now build Porsche you can’t go off road with. My dealer told me he has sold 10 to 20 times less new MP than the old ones.